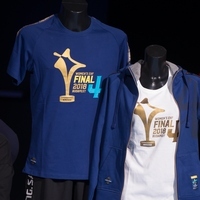 The draw for the Women's EHF FINAL4 in Budapest on Tuesday, 17 April also saw the launch of the event’s new merchandise range, developed by Salming, the official sports outfitter of the EHF Champions League. The range consists of t-shirts, hoods and socks for men and women and can be bought online at http://merch.ehfcl.com and on site at the Papp László Budapest Sportaréna on 12 and 13 May in the Hungarian capital. All items feature exclusive details such as the woven competition badge and logo prints. The socks can already be purchased for €8, tees are €20 and the hoods cost €50.